The first leed-plantinum home in California, Margarido House is striking both in its appearence and in its bold approach to green building. To achieve a high-performance thermal envelope, architects typically try to reduce the amount of glazed area, achieving as low a window-to-wall ratio as is possible. Yet Margarido House includes an extraordinary amount of glazed enclosure area, including a large NanaWall installation between the living room and the concrete deck overlooking panoramic mountain vistas. Architects tend toward the low window-to-wall ratio for two major reasons. First, even high-performance triple-glazing and similar solutions rarely approach the U-values offered by opaque envelope materials. Second, high-U-value glazing can be undermined by fenestration elements without thermal breaks, which conduct heat across the plenum in spite of best intentions. 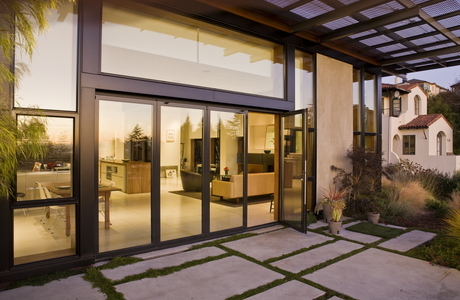 "NanaWall systems allow us to extend living space in our projects, by bringing the outdoors inside, and vice versa. Our homes 'live larger,'" McDonald boasts. Yet Mike McDonald, California Regional Manager for construction firm Ryan Associates, took on this challenge when he designed and built the home for his own use. McDonald was certain that a largely transparent home could be built green, without highly technical solutions. "I am a proponent of thinking about the project from a passive perspective," he says, adding that he focuses on strategies like natural daylighting, passive ventilation, durable nontoxic materials, and large overhangs for shading. 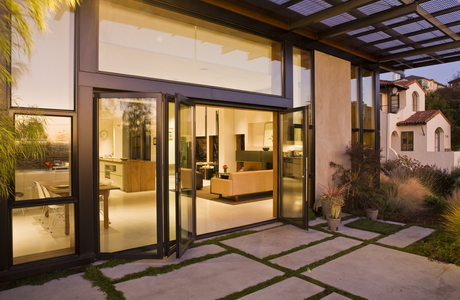 With natural daylight and ventilation in mind, McDonald specified NanaWall's SL60 Standard Thermally Broken Aluminum Framed Folding System for the opening to his patio. 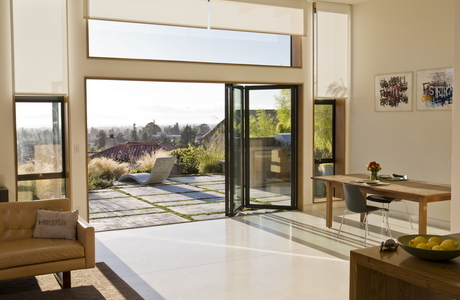 "The indoor/outdoor design element is particularly important in our more temperate climate in Northern California," he says, adding that other systems would have taken up space with large pockets for the sliding panels. "The NanaWall system was the ideal solution for the Margarido House front garden design," McDonald relates, adding that he has continued to use NanaWall in many other residential projects like Margarido. 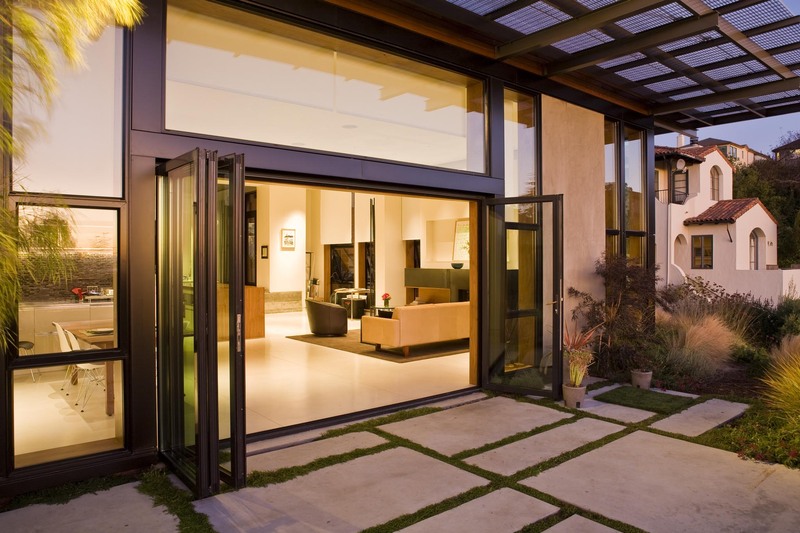 To date, his company boasts three LEED-Platinum California homes, and two of them include NanaWall opening glass wall systems. "They allow us to extend living space in our projects, by bringing the outdoors inside, and vice versa. Our homes 'live larger,'" McDonald boasts. NanaWall's superior construction helps builders like McDonald achieve the best of both worlds: elegant, cozy design and high-performance green building. 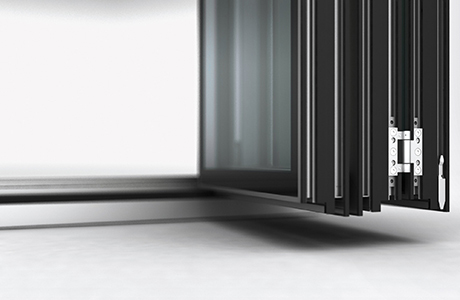 The SL60 system includes thermally broken construction, which blocks the unwanted transfer of heat across the fenestration materials. 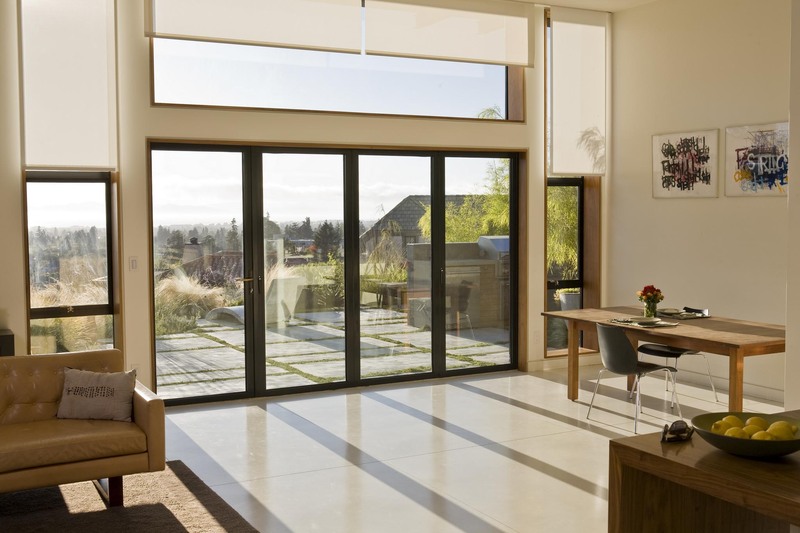 And because the designer is free to choose from a wide selection of glazing types, the final result can be as highly insulating as most commercially available residential windows. The system also allows natural daylight to spill into the living space, with unwanted solar heat gain mitigated by McDonald's shading overhangs. The occupants enjoy easy access to ventilation, too: They can have the living space completely open to the patio, and cooling breezes, in seconds. The result is a home that enjoys reduced heating, cooling and lighting loads, while boasting an enormous amount of transparent space in the enclosure. 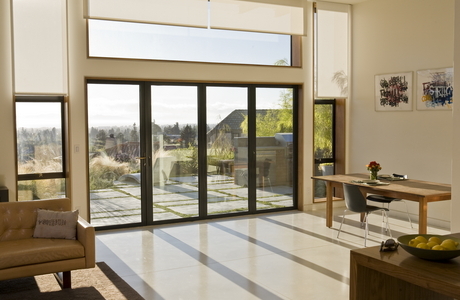 "The NanaWall system works well in a scenario where you want a large clear span opening, but do not have the room for large pockets for sliders," says McDonald, pointing out that the fully open system only obstructs a few inches of the opening from the panoramic view. McDonald has no plans to change his passive-energy approach to design, and will continue specifying NanaWall whenever possible. "NanaWall is our 'go to' product for folding door systems," he says.